The bit of this starting at 3:30, re: Chelsea Manning. Continues for about ten minutes. The podcast hosts are Iraq/Afghanistan vets. Not likely, what with the U.S. doing its damnedest to do it instead. I’m the last person to discount the reality of Putin’s cynical programme of expansion, but an attempted annexation of Finnish or Swedish territory would be a bit of a stretch, NATO being beside the point. Russia could make an historical case for annexing Crimea – one that didn’t require the chicanery we observed with rigged referendums and Little Green Men (that was for the benefit of his Know-Nothing base), but the cost-benefit analysis for that is very different. The games he’s playing in the Arctic shipping lanes and the claims he’s making on territories there whose status is unclear will likely satisfy his ultra-nationalist supporters and his/Dugin’s geopolitical ambitions well enough without risking a shooting war with the West. 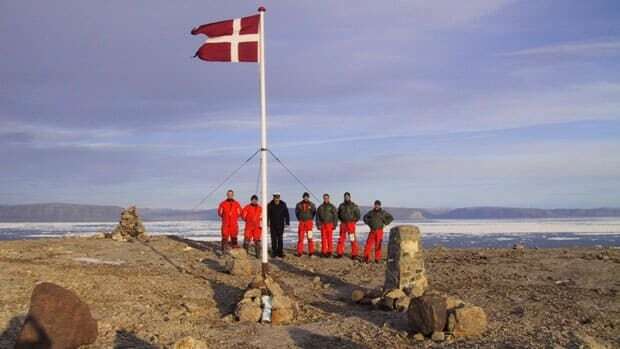 Maybe he can join in the “war” between Canada and Denmark over Hans Island by introducing vodka into the mix. There’s a 1.2-square-kilometre rock near the tip of Ellesmere Island, Nunavut, called Hans Island. Denmark says it’s theirs, while Canada is pretty convinced it belongs to them. Indeed. He has a nice new “science” outpost to play with there. The triangular complex, painted in the red, white and blue of the Russia's tricolor flag, has been built in remote Alexandra Land in the Franz Josef Archipelago in the Arctic Ocean. 8 years of the Syrian Civil War. Sadly I don’t think it is over. Turkey does not want the DFNS (Rojava) to exist. Whatever claim they had on Finnish territory is long gone. After the Finns kicked Stalin’s arse in the Winter War they defined their territory well enough that a violation would prompt international action (even though Finland isn’t a NATO member). Finlandization is a factor, but giving up territory isn’t a part of that. That’s a somewhat misleading take on what happened. The Finnish defence in the Winter War was exceptionally tenacious, but they still lost. At the end of the war, the Finnish army was completely shattered and the Soviets dictated the terms of the peace. The USSR started the war by demanding the right to fortify the Finnish approaches to Russia, and that’s what they ended it with. If they’d wanted to conquer all of Finland, they could have. Just when I thought I was going to be constructive this morning. Thanks! Anybody old enough should be having Viet Nam flashbacks.